Keyword strategy helps you select the keywords for your Search Engine Optimization campaign that will most contribute to your success. Targeting you efforts to keywords where the reward is high relative to the amount of work required enables you to more efficiently allocate SEO resources and deceive better outcomes. 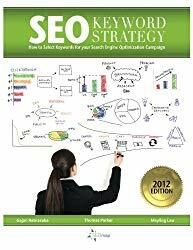 This book provides a framework for developing a keyword strategy, including: Keyword Generation - develop candidate keywords using facilitated brainstorming, competitor reconnaissance, and software. (Chapter Two) Traffic Analysis - forecast the additional visitors using search volumes, clickthrough rates, and trend analysis. (Chapter Three) Conversion Analysis – quantify the lifetime value of a visitor from a keyword by performing experiments and utilizing historical data. (Chapter Four) Competition Analysis – estimate the cost of achieving a #1 ranking by benchmarking SEO assets against competitors. (Chapter Five) Keyword Evaluation – put it all together, projecting a payback period, enabling you to spend SEO dollars efficiently. (Chapter Six) We walk you step-by-step through the process of creating your own keyword strategy, helping you find the keywords where there are the best opportunities.